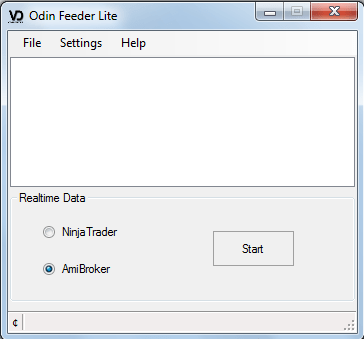 Odin Feeder is a tiny windows application from volume digger which fetches realtime data from DietOdin to NinjaTrader or AmiBroker. -Feeds NSE data to NinjaTrader or AmiBroker from DietOdin. -Data updated every seconds (for NinjaTrader, 1.5 seconds for AmiBroker). -Appends Bid Ask data (NinjaTrader). -Appends near month and next month contract. -Lite version (appends NSE stocks data only) available for free. 4)In the About dialog you will find a License Key. Copy the License Key exactly as it is and send it to volumedigger@gmail.com to get a 7 days trial of the full version. RTDF – Free Real Time Data Feed to Amibroker Real Time Data Feed to Amibroker RTDF is a light weight executable ( neither .Net nor Java) developed using C/C++. The demo release is free with NO time expiry and without proxy capability. Dear Sir, I tried making Connection between OdinDiet terminal and Ninja Trader 7 thru Odin Feeder. It worked so smartly. I was able to see real time chart of all the stocks in market watch of my Odin. But I am facing two big problem while working with it and seeks ur kind help in this regard. 1. I tried looking at Nifty chart the same way (using Odin Feeder Lite). But somehow it doesnt show Nifty chart in NinjaTrader 7, though able to show all the stocks. I figured out that it may be because of difference in name -- in Odin Diet terminal market watch nifty is added as NIFTY only. But in my NT 7 list it was named as sp cnx nifty. Then I also tried to add just Nifty in NT 7 selecting both as Index and stock. When it is added as Nifty index, nifty name automatically becomes ^NIFTY in the NT 7 list. As stock though NIFTY remains as Nifty. But all these didnt help as I was not able to see NIFTY chart in Ninja Trader (Odin Diet terminal showing real time Nifty data properly. 2. Second problem I am facing -- is about Backfilling. When I try to do Backfilling with the help of OdinFeeder Lite, it just backfills data for the first stock in the Odin Marketwatch List and ends there. No way i can simultaneously backfill data for 2-3 stocks which are in the list. Pls advise me best real time data software (free or paid), because right now using dataprovidor from market data providor.com with paid service. I am using your super trend afl with 15 min time frame. This time frame good or not?.Pls provide me your email id. contains a trojan virus. hence we cant use it. I use kaspersky antivirus.it removes the odindatafeederite immdiately. i am looking for auto trading software for the purpose of arbitrage in mcx. Can anyone tell me how to import data from odin to amibroker.